Jean-Pierre Melville's early documentary 24 heures de la vie d'un clown is a bland and disinterested affair, betraying little trace of the great things its director would soon go on to. Melville seems to have poured all his energy and visual interest into a few otherwise unmotivated shots of a shadowy man in a fedora hat standing outside and checking his watch, used as a framing device for the film. His place in the film is ambiguous, and one gets the sense that he's there only because Melville was naturally drawn to that kind of noirish image, a predecessor of Alain Delon's cold/cool hitman from Le samourai. One can only sympathize with this observer, glancing at the time, something I felt the urge to do frequently in the span of this all too long 18 minutes. This is a documentary about a pair of clowns who aren't particularly funny, and worse yet, rather than simply observe their routines, the film follows them into their even duller domestic lives, with the stocky clown Beby engaging in some sub-Chaplinesque stabs at physical comedy, at best eliciting a few wry chuckles. This is a film that seems to think the sight of a man falling down in the street is funny, and likewise a nerd being slapped by a woman who mistakenly thinks he goosed her. In other words, the kind of material that might have gone over, given some very gifted performers, in a 1920s silent comedy, but just falls flat here. Obviously, there's a reason that Melville never became known for his comedic talent or sparkling wit. But if the film's lack of comedy and general stylelessness isn't bad enough, the overbearingly literal voiceover totally kills it. The film was shot silent, then overlaid with a tinkly piano soundtrack and a narrator who not only describes everything that's happening on screen, but even reads, flatly, the dialogue being exchanged between the characters. The redundancy of the narrator in describing the minimal on-screen action is aggravating already, but when he starts monotonously reciting the back and forth lines of a conversation, as though he's standing in for missing intertitles, the film truly steps across the line from merely boring to aggressively bad. If this were all handled more competently, I might be tempted to think of it as a deconstruction or parody of the silent film aesthetic, but unfortunately I don't detect any hint that this is anything other than a straight-faced documentary, albeit a poor one. Clearly, Melville had not yet found the material to interest him or the visual style to complement it, though he already seemed to realize that men in sharp suits and noir lighting are where it's at. Dottie Gets Spanked is Todd Haynes' alternately hilarious and poignant profile of Steven (Evan Bonifant), a young boy who is obsessed with the TV character Dottie (Julie Halston), a Lucille Ball-like mischievous housewife with a disciplinarian husband. Dottie's antics are mostly admired by girls, and Steven's enthusiasm for the show  which even extends to compulsively drawing crayon pictures of his idol as he sits right beneath the TV  marks him out for exclusion at school. He's awkward anyway, a loner who doesn't quite fit in, and his overbearing father occasionally can't help expressing his disgust with his son's weird and effeminate ways. The father is seen watching football on TV, or as a looming shadow in the background as Steven reads a fantasy story about Dottie to his more tolerant mother. The father is an icon of all-American masculinity, and Steven is, as a psychoanalyst would probably have it, more in touch with his feminine side. In light of Haynes' own homosexuality, it's tempting to read the film as a coming-out story, a chronicle of a young boy who will one day realize he's gay. But the film is by no means clear on that point  Steven might be gay, but on the other hand he clearly sexualizes Dottie in his pre-pubescent way, and his confusion of gender roles (at one point, he dreams of Dottie, disguised as a man with a thick mustache, spanking him) suggests a more fluid and complex sexuality. In any case, the film is not so much about any particular sexual identity as it is about the concepts of "normality" and "abnormality," and the ways in which these ideas are codified at a young age in American society. Steven's growing fascination with spanking is an outlet for his own confusion about why he doesn't fit in, why he seems so weird to those around him. It could also be seen as a masochistic desire to be punished. When he overhears one of his mother's friends talking about spanking her daughter, he looks oddly excited, and perversely disappointed when his own mother says she doesn't believe in that. Haynes perfectly captures Steven's angst and confusion not only in the straightforward domestic scenes, which themselves play like mildly exaggerated material from a 50s sitcom, but in Steven's esoteric dream sequences, which provide an excuse for some stunning psychosexual imagery. In his dreams, Steven imagines himself as a king, complete with an absurdly tall and phallic cardboard crown, and Dottie as first one of his knights, and later his "executioner," standing in for a mustachioed weight-lifter who had been spanking him. These dreams inevitably decay into a stream-of-consciousness flow of rapid-fire images, from TV, health-textbook anatomy lessons, and the stuff of Steven's fantasies. The film captures him at a crucial moment in learning about his sexuality, and the fact that so much of his dream-world comes from half-digested media images indicates the profound lack of options society makes available to those whose desires and thoughts don't conform to "the norm." This is a typically engaging and thought-provoking film from Haynes, who is quickly becoming one of my favorite modern directors. As with all his work, it uses the techniques of pastiche and genre parody as gateways into deeper insights, and particularly for explorations of conformity and rebellion. The 50s sitcom is therefore rife with meanings to be plumbed by Haynes, and he gleefully takes on I Love Lucy, a show on which the central marriage was presented less as a union of husband and wife than as the relationship of a stern father to his rebellious daughter. Haynes' Dottie show parodies this idea with the scene where Dottie's TV husband (an obvious Ricky Ricardo stand-in, only missing the "you got some 'splainin' to do" catch phrase) bends her over his knee to punish her for her latest shenanigans. But the sitcom parodies aren't relegated just to Dottie's TV show, and one of the best scenes comes early on, when Steven's sitting in front of the TV, and turns to look back at his mom and her obnoxious friend. The camera frames Steven with the TV screen glowing blue behind him, but he's looking towards a mirror of the sitcom world, with these cardboard cutout suburban housewives giggling and chattering like they're on a TV comedy themselves. This even extends to the film's visual style, which is flat and affectless, like a TV show, for the parts of the film corresponding to Steven's reality. In the boy's wild dreams, Haynes switches to expressive black and white chiaroscuro, accentuating the boundary line between the forbidden strangeness of the creative person's fantasy life, and the drab conformity of "normal" society. 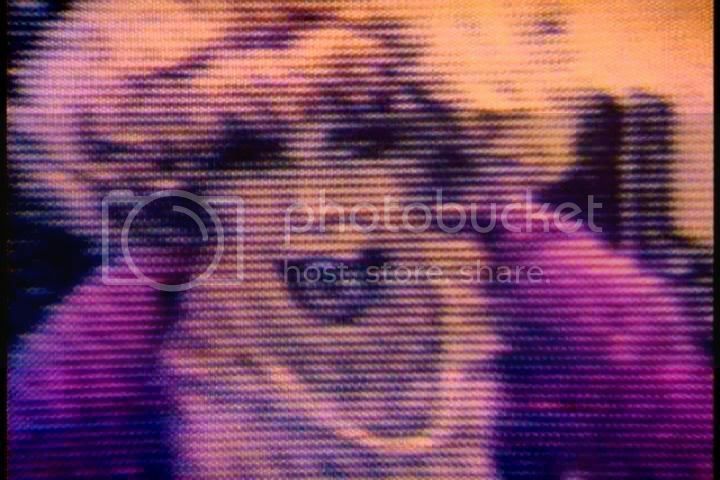 The first five minutes of super-8 experimenter Saul Levine's Notes of an Early Fall are mostly dedicated to an image that serves as a metaphor for this film's approach to visual materials. A turntable is playing a warped record, which is bent upwards on one side, this hill functioning as a speed bump each time it spins back around to the turntable arm. Whenever the needle hits this bump, the record skips and then the needle sets back down on the other side, sometimes in the same groove it was on before, sometimes on a later one, sometimes skipping back to repeat the same phrase it had just played. The record, from the small portions that can be heard this way, might be some kind of soul album, with a man speak-singing, in a deep voice, while a piano tinkles away in the background. The skipping record settles into spasmodic rhythms, then jitters into something new, and Levine matches the sound by providing corresponding jump-cuts in his editing, sometimes only switching between barely different perspectives on the record player, sometimes inserting unrelated footage of a window or a stand of trees. This aesthetic of skipping is upheld throughout Notes, which is constructed from several bodies of independent footage, jarred together by Levine's stop-and-go editing, which alternates between long, uninterrupted takes and periodic bursts of frantic cutting. There are shots of bears at a zoo, their shadows on the walls seen more clearly than the bears themselves. There are voyeuristic shots of a public park, seemingly filmed from hiding behind some trees, and similarly voyeuristic shots in a relative's home, of some old women who don't seem to know if they're actually being recorded or if Levine is just goofing around. There's a long, sustained shot of a window, its view obscured by thick foliage, and a hummingbird which persistently hovers in front of the glass, peering in and fluttering as long as it can before settling back onto the sill. The rhythms of the film ebb between extremely rapid, with each image barely on screen a second, and almost maddeningly slow. The opening record player sequence, though composed of many similar shots and interrupted a few times by unrelated footage, largely sustains a single image for over five minutes. The hummingbird sequence is equally lengthy, with no interruptions in watching the hummingbird's repetitive struggles to stay aloft outside the window pane. At other points, the images are rapidly shuffled together in repetitive patterns, the visual equivalent of a skipping record, bringing images back again and again in repetitive beats, cutting between unrelated shots, scattering impressions across the screen. The length of time that Levine initially spends watching the hummingbird at the window speaks to his fascination with its unceasing pattern of hovering, descending, walking along the sill, and then taking flight again. But it also establishes the bird and the shot of the window as strong signifiers in the viewer's memory, and when these images recur in second-long fragments in later montages, they stand out, as though glistening, the force of memory filling in the gaps. This free-associative play with images and their rhythms elevates Notes from the formalist experiment it might've been to a strangely moving rumination on memory and observation. I've seen a handful of Levine's other films from the DVD of selected works put out by TV Eye, but none of these other stiffly formalistic works struck me as having the soul, vitality, and energy of this film.